'To create is always to learn, to begin over, to begin at zero. Part of the discipline of art as meditation is the discipline of struggling always from the beginning - "In the beginning," one might say.' Matthew Fox, Original Blessing, p198. This feels like the first time in months I have been able to just sit. To sit quietly. To sit without the feeling that I should be doing something else. To sit without being anxious about anything. To sit with only a very slight chance of being disturbed. Just occasionally I seek out a place like this. A place where time has no value and where I can place to one side all the things that demand my attention and just give myself permission to just 'be'. I am away for the demands of work, I know my family are safe and I have just finished a run of busy, but very creative and inspiring weekends. I am here, alone - apart from the presence of many non-humans who surround my temporary sacred place. I have been in this place for about an hour now and I've decided to get out my sketchpad and write. It seems impossible and so idealistic to "go-slow" and to savour the more natural side to life amidst the demands and anxieties that abound in work, the family and life in general. I'm not going to explore these here as I am reluctant to dwell on the negative things that can occupy my thoughts at times. All I will say is that trying to live a positive and empowered life as encouraged by so many personal development advocates can be very hard work! I've stepped out of my comfort zone several times recently by volunteering to organise a grass maze and children's quiz at the Luton Hoo Walled Garden Apple and Pumpkin Gala; and running a craft activity in Hitchin's Market Square for the Triangle Community Garden. Both left me incredibly energized and I didn't enjoy coming back down to earth again! Some people seem to have so much energy and a seemingly insatiable appetite for doing stuff and achieving things. I know I am very hard on myself when I look at the skill-set of other people and I have to learn how to be constructive in such situations. I am in my lonely place, a sacred place I'd call it, just for a few hours this morning. What will it teach me I wonder? I am not alone here. Although I am in a place where no people will pass me, I am conscious of the many non-humans that surround me and so I don't feel alone. A moth flutters on my umbrella; a spider crawls up my sketchpad; several other small beetles and invertebrates either crawl over my hand or over the white pages. There is a ladybird too. A few birds are tweeting in the trees and I am surrounded by trees. 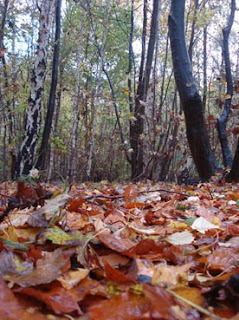 Trunks blackened by the pouring rain - stark against the bright golden yellows and browns of the vivid carpet of beech, oak and sycamore leaves. Even in this wetness beneath a heavy grey sky the woodland is awash with dense colours that the spirit of autumn brings. It is a time of death, of harvest, of fruitfulness; of shedding unwanted things, preparation for hard times and of giving back to the soil. Mosses look a deep healthy green and beneath the carpet of leaves I know there is a thriving community of fungi, invertebrates and microorganisms. I see some very tiny toadstools that have forced their way through the decaying organic matter up into the freedom of the space of the woodland floor. It is warm for the first day of November, about twelve degrees centigrade according to the weather forecast yesterday. I'm feeling quite cosy, though I have a good few layers on and a wind-proof coat which I certainly need today. I'm on the lee side of the hill and up above me the trees are facing the fullness of the very strong wind and rain that is pouring in from the south-west. Where I am, blades of grass are just gently swaying, but later I am sure I will feel the full force of the wildness. I'm glad I have a large umbrella to shelter me from the wind and the rain, I know that I need to keep as warm and dry as possible if I am to stay here for any length of time. The wind and wet can soon cool the body, so I huddle up tight and keep warm. I've just been re-reading Matthew Fox's Original Blessing. I wish it wasn't quite so heavy going, one day I'll get round to trying to write a more easily accessible version of it! It is basically a book about 'rediscovering' the blessing of Creation given to us by God. Do I prefer shelter or do i like the wind and the rain? How do I deal with comfort zones? What can I share with others? How can I change on my return home? How can I maintain that? How, ideally, should I deal with work and family? How does nature cope with rain? Growth, waiting, indifference...? Nature is always creating, transforming and never static? How is that reflected in me? Was Jesus like that? I watch the leaves tumbling down though the branches and give thanks for this place. It is time for me to leave and see what else the day has to offer me.